Scratch off must-see destinations as you travel to reveal the artwork underneath. Oh the Places You've Been! Susan Sontag once said, "I haven't been everywhere, but it's on my list." This poster provides some motivation to work on your own travel wish list with a collection of 100 must-see destinations. Grab a nickel, Euro, or Yen and scratch off spots as you go, from tourist attractions like the Grand Canyon and Niagara Falls to more aspirational treks like the Great Barrier reef and Mount Fuji. The fantastic images revealed will chronicle your globe-trotting in an interactive visual map. Made in the UK, home to Stonehenge, Edinburgh Castle, and the Giant's Causeway. Click here to see the full list of locations and countries included . 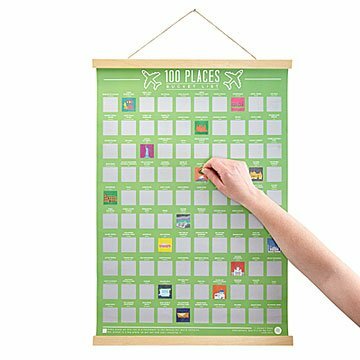 The best gift for the person in your life who loves to travel AND loves scratch-offs! It was a Christmas present. Excellent gift for any age! Got this for my husband as a gift- it already helped inspire our next trip! Amazing gift to give to your traveler friend! I bought this item for a gift for a friend. Not going to be using it myself but loved the idea of the poster and being able to scratch off places you've traveled to. The poster was great quality and the quality of the pictures were also vivid and clear. Delighted to give this to my friend and former roommate to remember all the fun places we've been together and give him goals for new places to visit too! Nice visual reminder of my travel goals, easy to scratch off.